It may be true that I have broken or worn out dozens of bicycle parts over the years, and 2008 was no exception particularly because of the Tour Divide. But one item I have never broken is a bicycle wheel. Well, that is not strictly true as I have broken spokes before—but I have never committed irreparable damage to the beefier elements of a wheel, such as the hub and rim. Part of the reason is that the super heavy Mavic CXP30 deep-dish rims (550 grams each!) on my Cannondale race bike are simply indestructible and I haven’t even had to true them one time in the last seven years. In fact, just last week I rode seven miles home on a completely flat tire (due to forgetting to pack my CO2 inflater) with no ill consequences except to my patience. Bontrager wheel purchased in December, 2003, with crack that developed in aluminum hub flange of front wheel five years later (on 12/14/2008) after 36,000 miles, when temperature suddenly dropped below freezing. 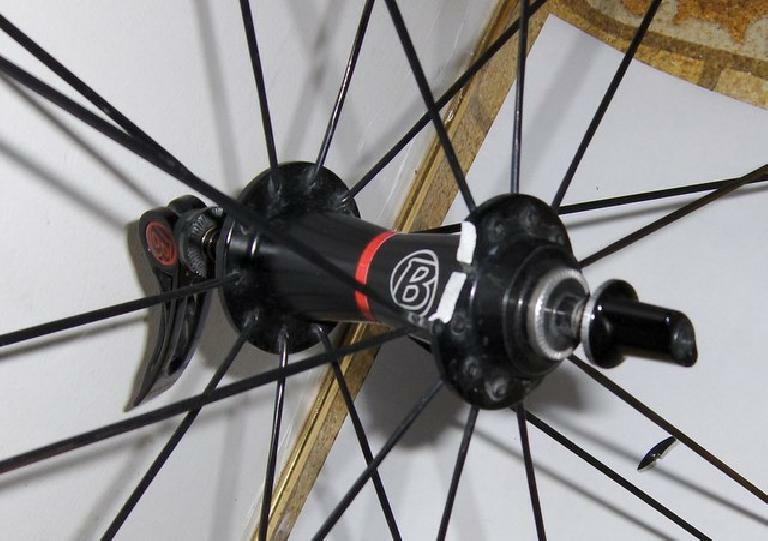 When wheel was removed from bike, the cracked piece broke off from the flange and is shown on the white paper below the wheel. The white section on the top of the hub flange is where the broken-off piece was. The black line in the middle is where the spoke was secured. See the photo below. Yes, part of the hub flange broke away! This wasn’t even due to an accident, just structural fatigue. Joe is 74 years old. The wheel had accumulated 36,000 miles in 5 years—meaning that even at his age, Joe has ridden more than 7,000 miles per year. That is more miles than I drove last year. This incident occurred near the top of Mt. Diablo, the highest summit in Contra Costa County in California and an 11-mile, 4,000′ climb. This was the 23nd week in a row he had ridden up Mt. Diablo—and it would have been the 78th week in a row had a motorist not hit him sometime after the 50th week he rode up Mt. Diablo, which injured him enough to keep him off the bike for over a month. This unfortunate incident happened in the worst of all places—at the top of Mt. Diablo, or the farthest distance from home during his entire ride. This “problem” was severe enough that ultimately he had to be rescued by a good Samaritan driving down the mountain. In fact, Joe’s story is so good that I’ve reprinted his write-up of his saga below in its entirety. Congratulations, Joe! It had become important to me to cycle to the top of Mt. Diablo every week. Don’t ask me why. I think that doing so became a measure of my fitness. I had started the custom 78 weeks earlier and had never missed a week for 50 consecutive weeks until I was knocked down by an automobile whose driver didn’t see me. That happened near my home, not on the mountain. It took me 11 weeks to recover completely but on the sixth week I was back on the mountain, cycling to the summit again, and the latest streak had continued for 22 consecutive weeks. My goal was to exceed 50 weeks, but as winter approached it was getting tougher every week. It was on the 23rd week that I had my most unusual experiences on the mountain—bad and good. The weather changed so abruptly at the top from above freezing to below freezing that it started to snow, and all the wet spots on Summit Road changed almost instantaneously to ice. But worst of all, as I was descending, the hub of my front wheel cracked under the strain of the freezing temperature. The wheel started to wobble against a brake pad on every revolution. This happened after I had descended one mile down the 11-mile mountain. I was still 22 miles from home, where I had begun my ride. The crack was at one end of the hub at the point where the spokes connect. The bike was almost un-moveable, except on a steep downhill. The wheel was five years old and had carried me 36,000 miles. It was one of the very few things on my bike that had never been replaced. In fact, within the previous week, I had talked to the owner of my bike shop about the possibility of replacing it soon, but I had no thought that my life could be in jeopardy from a fatigue failure. It was Sunday, December 14th, 2008. A cold spell of arctic air had reached the Bay Area overnight, and the forecast was for the possibility of scattered showers that morning, with snow as low as 1,500 ft. The forecast for the ensuing week was grimmer with the likelihood of snow and/or rain all week. If there were fresh snow on the 3,849-ft mountain, the road would be closed, and my streak would be over. At 6 a.m. on Sunday morning, I called the Mt. Diablo weather hot-line, which is updated every minute (925-838-9225). It was 28 degrees atop the mountain with the wind at 15 mph. Though it was still dark, I made a decision to gamble that I could cycle the 12 miles to the mountain, climb it, and get home before the snow came. If I could accomplish that, I would have up to 13 more days before I had to climb again, and perhaps the weather would be better. Dressed warmly in layers, I cycled to the southern entrance at Diablo/Danville, congratulating myself on my good judgment as daylight blossomed pleasantly with only a few scattered dark clouds. The pavement was dry. It was a lovely routine ride all the way up to the Junction at 2200 feet. The only difference from other Sunday mornings was that it was exceptionally quiet with almost no bicycle or auto activity. I attributed that to preparations for the upcoming holidays, as well as the threatening weather forecast. As I reached the Junction, I could see that the terrain above was shrouded in fog. In fact, the fog started at 3,000 ft, just above the parking lot for Juniper Campground. This was in contrast to what had been the case in the previous weeks. Then, the fog was below 3,000 ft, and when one got above it, the warm sun was out all the way to the summit, and the view was similar to what’s seen from an airplane, looking down at the clouds below. On this particular Sunday, the visibility was about 50 ft in the fog—better than in previous weeks. There were wet patches on the road under every large pine tree, as though ice had been on the tree overnight, and when the temperature warmed at daylight, the ice dropped as water. Not a single cyclist had passed me in the entire 11-mile climb until I was within 30 yards of the top. Then a young guy zoomed by me as I labored up the final, 17-percent slope. There was only one car at the summit (probably that of the ranger on duty in the museum, because I heard a TV set inside). The fast cyclist descended immediately. So I was left alone in my wet clothes. It took me less than ten minutes to reshuffle my clothing. Next to my skin, I put on a dry polyester jersey from my saddlebag. Atop that I put my waterproof windbreaker. And atop that, I put the three layers of wet clothing. On my head was a skull cap under a balaclava, and of course my helmet. On my legs were unpadded shorts, covered by waterproof pants. On my frozen toes were extra-thick Smartwool socks and booties over the shoes. I had thick gloves. In short, I was well prepared for a normal descent. I noticed white spots on my clothing. It wasn’t dandruff; it was snow! I had better get out of here fast, I said to myself. But not as fast as usual! All the wet spots on the road that were there ten minutes ago had disappeared. The snow was coming down harder but wasn’t yet settling. I became much more cautious as I felt my wheels slipping a bit on the ice. Suddenly I heard a very loud metallic clunk, as though a big rock had hit my front wheel. There was no rock in sight. The bike began a jerking motion as the now-wobbly wheel rubbed hard against the brake pad on each revolution. I immediately assumed that a spoke had snapped, but as I looked over the wheel while still riding, I couldn’t find any broken or missing spoke. Puzzled as to what had happened, I kept my front brake permanently squeezed, so as to minimize the wobble. I was able to descend at about 5 mph with one foot out of the pedal clip in case I were to fall. As my hand tired from the continuous squeezing, I had to stop at each campground on the way down to give it a rest. As I descended, the snow turned to rain, which became heavier. A few cyclists were climbing the mountain now. I warned them of the snow at the top and of my broken hub. They were undeterred. A few autos were climbing the mountain too, but actually, there were more descending than climbing. Some people had apparently camped out overnight to test their cold-weather gear. When I reached the Junction 3-1/2 miles later, I called to a young fellow in a park uniform who was descending the stairs to the bathroom. I told him of my plight. It turned out that he wasn’t a ranger, that he was an aide who was about to clean the bathroom and who wasn’t able to help me, either by contacting anyone on his radio or by giving me a ride in his truck. Although he was sympathetic, which I appreciated, he told me I would have to find a ranger and gave instructions on how to reach the maintenance facility, where there would be one, because there was none at the Junction now. I began to shiver. The rain was falling harder. As I descended down Southgate, I considered my alternatives. This was one time where it would have been useful to carry a standard cellphone. Mine would only call 911. I wasn’t that desperate just yet. If I could get down the mountain under my own steam, I could perhaps get someone to call me a taxi to take me home. 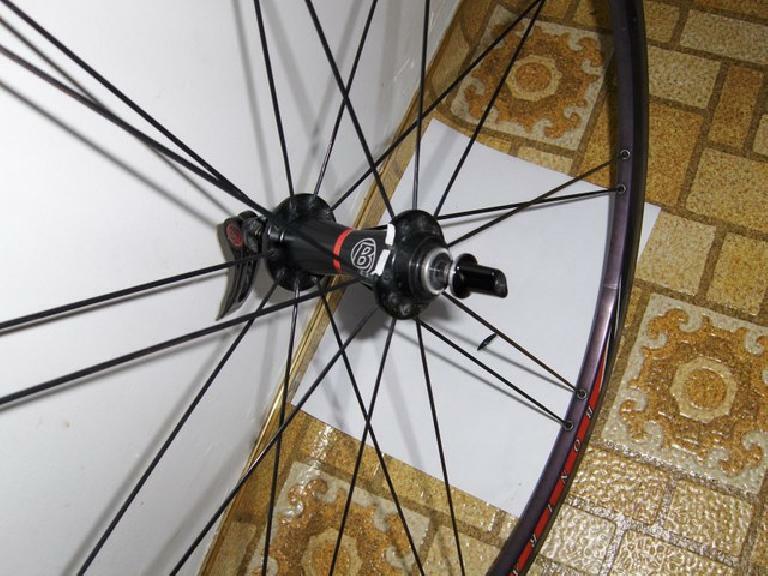 Or perhaps I could get to a bike shop in Danville, where I could buy a new wheel? Even so, bike shops don’t open till noon on Sunday. I was ashamed to call a friend or club member because I had gotten myself into trouble due to my own foolishness. There was no excuse for it. Even if I had wanted to call my next-door neighbor, this was the day he was flying to Japan. A ranger’s vehicle was approaching me rapidly from below. Help is coming, I said to myself; the young fellow at the Junction must have summoned a ranger for me. But to my dismay, the ranger continued at speed up the mountain, only returning my nod. I chastised myself for not trying to stop him. I had descended past the maintenance facility, and now there was a bit of climbing to do as I approached Rock City. My bike could move only while descending, because there was too much friction against the brake for it to roll when climbing or on flat ground. If I hadn’t loosened the hub’s quick-release, the wheel wouldn’t turn at all. (This was one time where I was glad I hadn’t filed off the ends of the frame, as some friends had recommended, to allow the wheel to be removed more easily.) My speed had slowed to just two or three miles per hour. A cyclist passed me on the downhill, as well as a few cars and pickup trucks. I was too embarrassed to flag down anyone. Suddenly, a large SUV slowed down while passing me, and a friendly lady passenger rolled down her window and congratulated me on reaching the summit on such a day. I blurted out that I had a broken wheel. She asked if I needed help. I nodded. Immediately, the driver (her brother) pulled over, and they both got out in the rain to talk to me. I asked if they could fit my bike in their SUV and take me to a place where I could call a taxi. There are some really nice people in this world, and I was very thankful to have met two of them! Fortunately, Mike gave me his business card, so I hope to remain in touch. When we reached my house, Mike took a photo of my cracked wheel to show just how cold it had been. The camera was working again. Melissa said that it had frozen when she had tried to use it earlier on the mountain. The moral of this story: 74-year-olds shouldn’t be climbing Mt. Diablo alone in snow and rain! I had the same problem with a Bontrager race x light front wheel in a Trek 5900 of 2003,the bike and wheels had done about 500 miles over the years- I am not a regular rider and I have another bike.On taking the bike down from it’s hook in the garage I noticed the flange had broken.Returned the hub and flange bit to Trek who got a 3rd party (importer) to phone me but no follow up.Finally got a hub off ebay. I too had the same problem on a 2004 Bontrager Race Lite on a Trek 5200. Sadly to say I only had about 500 miles on this wheel when the flange broke. This bike was stored inside (72 degrees). I discovered the broken flange while getting to ride. Obviously, this hub is probably not covered by warranty in 2011.